Six months ago, I had bought a Philips AC1215/20 Air Purifier. Yesterday, my second air purifier was delivered, this time a Mi Air Purifier 2. I did this, because I was mostly running the air purifier in my room. With Delhi’s pollution levels soaring, my mother’s eyes started itching. On the days pollution had been really bad, I had kept the air purifier in her room, including on Diwali and the day after Diwali. However, it isn’t possible for everyone to sit in the same room all the time, so I knew I had to buy another air filter. When I had bought Philips AC1215/20 Air Purifier, I had also thought about buying the Mi Air Purifier 2, since they are similarly priced. However, I bought the Philips Air Purifier instead, because I felt its air filter will likely last more than Mi’s. While theories are good, I feel practical also needs to be done. So for the comparison sake, I bought the Mi Air Purifier 2 this time around for Rs. 8,999, even though Philips was available for Rs. 8,799. Design: Mi is better in terms of design, it looks more like a large speaker. Air Flow: Mi has better airflow, it is rated at 310 m3/h, while the Philips is rated at 270 m3/h. Apart from that, the way that Mi Air Purifier is designed, it does seem to circulate the air better throughout the room. In fact, this can be an issue in winter, since even now, after turning on the Mi Air Purifier, my room feels cooler and air can be felt to be flowing throughout the room, while this isn’t the case with Philips. Filter life: Theoretically, this is where the Philips really triumphs. With a washable pre-filter and separate carbon and HEPA filter, you should get better filter life. It has been 6 months since I bought the Philips Air Purifier and only now I feel the filtration has deteriorated, thus prompting me to order a HEPA replacement filter for it. Mi, on the other hand, has an all in one air filter, so either you can let the pre-filter get clogged or clean it with the help of a vacuum cleaner, which could bring down the efficiency of the HEPA filter. Add to this, Mi Air Purifier has been running for a little over 19 hours and has already consumed 2% of filter life and as per its app, only 142 days (less than 5 months) of filter life is remaining. Even though the filter is supposed to last for 145 days. Then again, at evening and night, the PM2.5 level was beyond 600 in our home (nearest pollution center was reporting 999 outdoor and it can’t register pollution beyond that) and even after running all night with doors and windows closed (1 window open) the PM2.5 level hovered around 300. So these are extraordinary times and thus conclusion can only be made after a few months of usage. Filter availability: Filter for Philips as well as Mi is available online on Amazon and Flipkart. Philips’ filters are also available offline, so as far as availability is concerned, Philips is ahead of Mi. Though filter of both regularly goes out of stock online, so it is a good idea to purchase a filter, as soon as either give you an indication that filters are about to reach their end of life. Build Quality: There are places where the Mi seems to have better build quality than the Philips one, especially when it comes to the power cord. However, Philips has a handle to lift the air purifier, while Mi doesn’t. Plus compared to the hollow design of Mi, Philips feels sturdier. Features: This is where the Mi comes out on the top. Even though both the air purifiers have similar features on the air purifier. 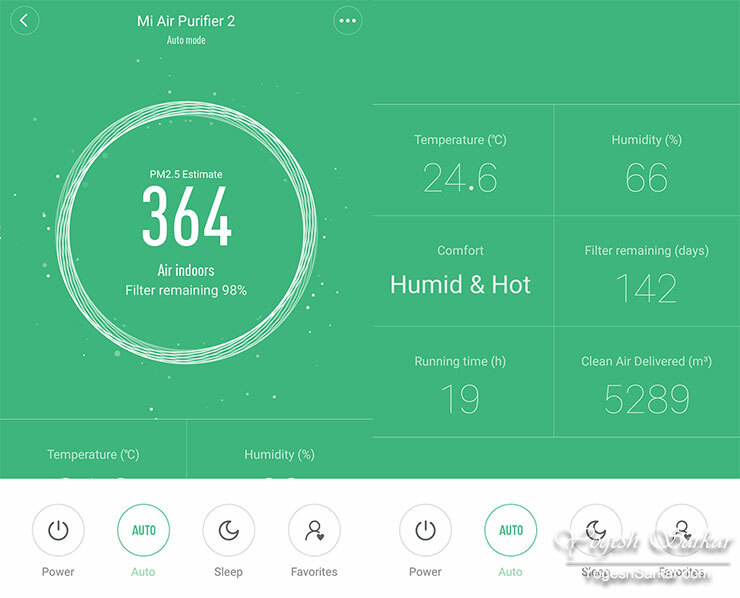 The fact that you can control Mi Air Purifier with an App, which also tells you the estimates of PM2.5 level (Philips only has 3 color level indicator), temperature, humidity, amount of air purified, running time, filter consumption etc.. Though the PM2.5 measurement can only be done till 600, after that it just keeps showing 600. 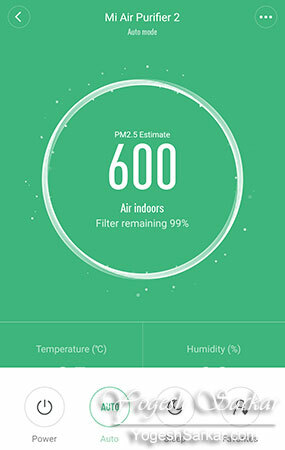 This app also lets you fine-tune the speed of the air purifier to your needs. Though most people will be better off setting both the air purifiers on auto. The only issue with Philips when it comes to auto mode is, it is way too eager to enter the night mode (even if you end up casting a shadow on it) and reduces its speed to a crawl! Thus I generally avoid keeping the Philips in auto mode, unless I know, no one is going to cast their shadow on it! Power consumption: Mi should consume less electricity as well, but not by a huge margin. However, the fact that it delivers more clean air while consuming less power is a notable thing and must be appreciated. At the moment, I am happy with both my purchases and I hope, they will lessen the impact of pollution on my health and that of my loved ones. Only time will tell, which air purifier turns out to be better than the other and I will write a detailed comparison, once I reach that conclusion. I have to say one thing though; the PM2.5 reading available in the app of Mi is a lot more disconcerting to look at than just the red indicator of Philips. And you will likely end up checking it again and again! You can buy Mi Air Purifier from Amazon http://amzn.to/2jcev7f or Flipkart http://fkrt.it/y0ZjY!NNNN. You can buy Philips 1215/20 Air Purifier from Amazon http://amzn.to/2hfSyQc or Flipkart http://fkrt.it/yyG2r!NNNN. Very informative and helpful review. Have ordered the Mi myself. Help me out if u can. 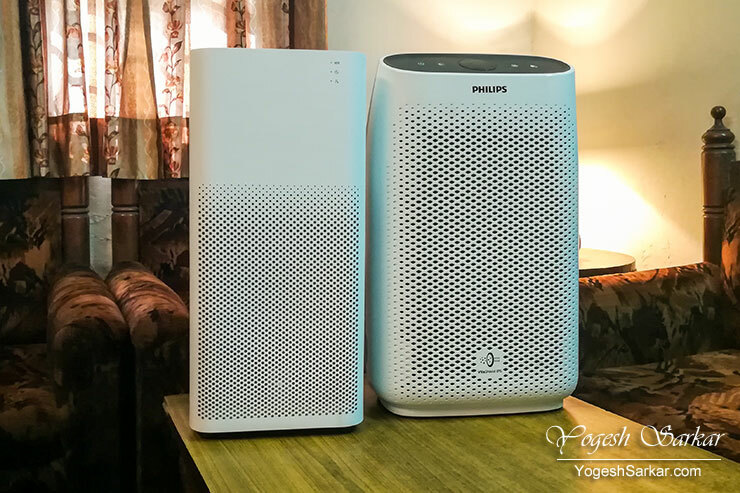 Which would be better – Philips 1215 or Mi Air purifier 2 ? Philips is giving 2 years + 3 years warranty right now while Mi Air Purifier has only 1 year warranty. Since u have both these items, i would really like ur input on which one would be better choice in terms of lower total filter cost over the time while considering warranty as well. Sumit, as far as filter cost over long term goes, I still have a feeling Philips is going to be more economical, especially if you aren’t replacing Carbon Nano Filter each time you replace the HEPA filter. Otherwise, they will be neck to neck or the Mi will score better. As far as cleaning the air goes, it does seem like that the Mi does a better job. But then again it turns green at PM2.5 level of around 80. I have no clue when the Philips turns blue, but I have a feeling, it does it at much lower levels and hence seems to be trailing behind, at least visually. Functionality wise, Mi is better. Apart from the fact that it needs a vacuum cleaner to clean the pre filter, while the Philips’ pre filter can be simply washed off like an AC filter. If you aren’t cleaning the pre filter on a weekly or at least on a biweekly basis, then the filter will get choked. Thanks for sharing the information. As it has been almost 1.5 months since you bought Mi air purifier post philips air purifier. Can you pls let me which one is better it terms of following parameters. 4. Filter cost along with replacement tenure. Mi wins in almost all departments, except build quality and filter cost, in which I believe Philips does a better job. They claim to be able to catch particles much smaller than PM 2.5. Yogesh ji, I appreciate your efforts. Can you please suggest mi best one amongst these? 1. Philips ac2887, 2. Honeywell Air touch i8, 3. MI 2s. Purchase will be done based on your detailed verdict. Awaiting your reply. Mi 2s, it has the maximum clean air output out of all 3 and the filter replacement isn’t all that costly either, since it is an all-in-one filter. The only issue is, you will have to clean it every couple of weeks using vacuum cleaner, while the Philips pre-filter can be washed. The C7 and A3 filter of Philps 1000 series are they available in local market in mumbai or do u know where to get in mumbai as pers on amazon and all the sites have offers and stuff …but feel it can get damaged on the way …. No idea about Mumbai, but it should be available at Philips stores. I have order filters online through Amazon and Flipkart, no issue thus far. As of now you are having 1 yr exp of both air purifiers. Mi is a much better bet with better air flow, app control and cheaper filter replacement. But it need to be cleaned every couple of weeks by a vacuum cleaner, else its efficiency might go down. In case of Philips, you can wash the pre-filter. So if you have a vacuum cleaner (even the most basic one would do), go for Mi. Yogesh, how much did you spend on filters in the last year for both the models? Both required around 3 filter changes i.e. around 5k for the Mi and around 6.5k for Philips in terms of filter costs.